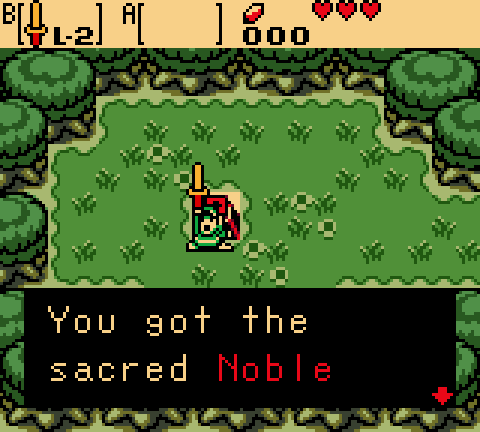 The trading sequence complete, Link approaches Holodrum's legendary Noble Sword. Ocarina of Time 3D is a handheld game. For Screenshot: Challenge Accepted #100 you must choose a challenge from the past and create a (brand new) shot based on the challenge including tileset restrictions, etc. I feel this is a good way to look back and celebrate S:CA after 100 creative and demanding challenges. This doesn't follow the rotation. After #100 we will resume the rotation as normal. Think of this as a bonus wild card challenge. Moo2wo - Really neat recreation of the original screen. I definitely see the similarities here and I really like how Firebird is used here. Good job overall. Joelmacool - Interesting idea of turning a 3D scene into a 2D environment. I can see the similarities between this and OoT 3D, but it's quite empty and open compared to previous screens you've done, though it is nice to see screens not so cramped up to death from time to time. 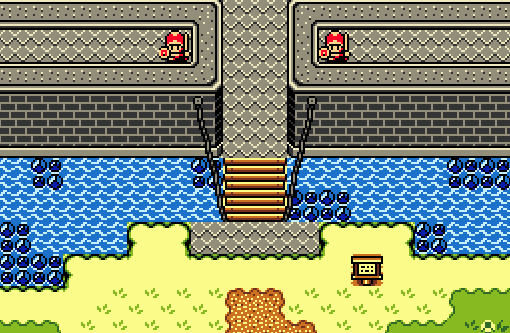 TheBlueTophat - It's a pretty neat screen, but I think this was a bit TOO different to the original screen, probably the point where it doesn't even resemble the original screen at all anymore and would probably suit better if this wasn't a recreation. As for the screen itself, it looks nice but the background is incredibly empty. You could add some hanging skeletons or torches or something to make the background stand out a bit more. What detail do you want? It's a field. Moo2wo looks awesome and most likely fulfills the challenge the best, but TheBlueTophat wins for me. I would love to play a game like that and the fully black background and the design feels really atmospheric to me. Joelmacool, your screen feels kinda plain. I'd say it could use a few more details. 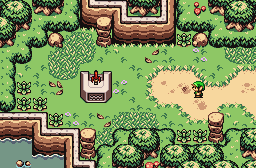 Some bushes, some wall torches/decor, an arch for Link to pass under. 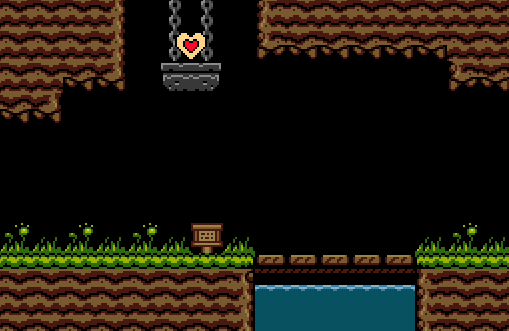 I like this a lot, maybe just some background stalactites, Link, and an enemy? Edited by Cukeman, 17 June 2016 - 11:54 PM. Moo: In my opinion, this is the best when you combine creativity and faithfulness to the original screen. It took me a few moments but I see the inspiriation and the faithfulness. It's just creative enough to be recognizable without taking too much liberty in the creativity aspect. Joel: There's not much to say. As a recreation this might be the most like the original, and I can applaud for that. But I do agree with Eddy. I wish you had taken more liberty with the screen to make it different but still obviously the OoT recreation. Though I can't fault you, it isn't enough for me personally. TheBlueTophat: In my opinion, you took too much liberty with this screen without making it unique enough to capture my attention. As much as I love sideview screens I just think it's too different thougb I do see the similarities. Moo2wo wins with 58.33% of the vote. Congratulations!